As we fly around you may wish to visit the other chambers in my Lair by using the passageways below. Feel free to explore my Lair. I'll be waiting here for you when you return. Our son Andrew, a United States Marine. USMC - "Rifle Sharpshooter" - Weapons Qualification Badge. 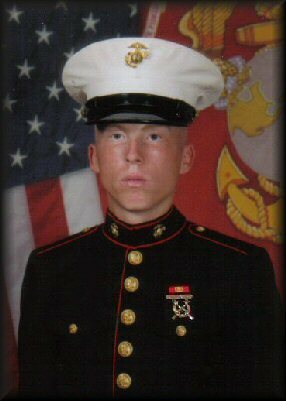 Graduated Marine Basic Training on November 17th 2006. 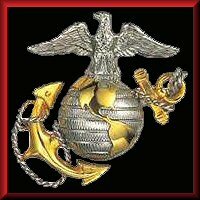 Graduated Marine Combat Training on January 23th 2007. Graduated Combat Engineer Training on March 29th 2007. If you are using any of the Avatars or Images on my site, Please do not link the Avatars or Images to the ones on my server as it is running up my bandwidth. If it continues I maybe forced to take down all the Avatars and Images from my site. Save the Avatars or Images to your hard drive then upload it onto your site, and link to it there. I will be changing the name on them from time to time. Amber Alert Ticker for the United States. Amber Alert Ticker for Canada. The Missing Kids Website has been introduced to 16 countries and more are joining every year. All the poems and stories in my site were written with the hope that they would stir the reader's emotions. I wrote most of them from my own life's experiences and those of the people I have met through out my life. The others I wrote simply from an over active imagination. They are not meant to portray my emotional state or that of anyone person, but rather the possible emotional state of most people at sometime in their life. Although some deal with what some people would call fantasy. The ones about Dragon's (who's to say there were no Dragon's once or that they may still be around), even they can stir up ones emotions. This site contains hyperlinks to World Wide Web sites that are created and maintained by other persons, groups, and/or organizations. I have included these links because I think that visitors to my site may find them both of interest and helpful. Keep in mind just because I have links to them, that does not necessarily mean I endorse the views expressed on those Web sites or sites they link to. Also, I do not guarantee the accuracy or completeness of any information presented on these sites. Furthermore, visitors should be aware that other sites which are linked from my web site may use persistent cookies that track visitor viewing habits. For more current updates visit My Lairs Web Journal's. The links are at the bottom of all my pages. I started building my Lair back in late 1996 when I was with AOL. In 2001 I left AOL and moved my lair to its current home. It was originally created using Allaire's - HomeSite 3.0, then Homesite 4.0, and as of Feb. 6th, 2005 I started using HTML-Kit Version 1.0 (Build 292). Also on Feb. 6th, 2005 I began updating DragonMay's Lair from HTML code to CSS code, and I finished it on March 7th, 2007. On Monday, Sep 26th, 2005 I started adding my Rail Way Station to my site. Due to some small bugs which were quickly worked out as we came across them, and my work schedule I finely got it up and running with 4 (four) different internet "Rail Way" trains running in and out of it on Saturday, Oct 8th, 2005. I am now up to Ten pages which currently have 175 Scam Emails with 35 Scam Emails on each of the first four pages and 177 Lottery Scam Emails with 37 Lottery Scam Emails on the first page, and 35 Lottery Scam Emails on the other four pages. I also have 22 email/lottery scam pages where I replied to the scammers. Along with one page on Chase bank scam emails, a page with other bank scam emails, a page with scam job offers, and a page about work at home scams. My internet Scam Chamber will continue to grow as I find the time to add all the other scam emails I have and keep getting. You will find that I add onto it, and remodel it whenever I become bored with the way it looks inside. There have been over four million visitors to my lair since I opened it. My Lair is best viewed at screen resolution 1024 x 768 with a 17 inch or larger monitor or 800 x 600 with a smaller monitor. Other browsers may not show the pages correctly or completely. This site can also be viewed correctly using Netscape Browser it you have it set to use the Internet Explorer "Rendering Engine". Too set this up in your Netscape Browser; with it open click on Tools, then Options, then Site Controls. In this window look to the lower right corner for Rendering Engine and select Internet Explorer and click OK. If you do not have Internet Explorer's Rendering Engine listed you will have to download and install Internet Explorer (see link above to get I.E.). The Music on some pages are set to auto-play and loop. Other pages are not set to auto-play. You can turn the music on and off with the controls at the bottom of every page. It works best if you use RealOne Player as your default Midi Internet player. Click here to get : RealOne Player. All my poems and stories are copyrighted. That does not mean I think they are great, but rather that I wish for them not to be taken and used against my will to represent something I did not intend them to. They are for the enjoyment of those who wish to read them, nothing more. If you would like to use one or more of my poems for school, all I ask is that the poem/poems be copied in full including the copyright information. And that you email me twice. First to let me know which poem/poems you want to use. And a second email to let me know what comments good or bad were made about the poem/poems. As this will help me in the future to write even better poems. If you would like to use one or more of my poems for any other reason, please email me with which poem and what you would like to use it for. I will get back to as soon as possible, as I check my email everyday 3 (three) or 4 (four) time a day. I do not want any of my poems, or stories displayed, or put up on anyones else's web site. You are how ever, more than welcome to put a link to any Poem or Story in my Lair on your site if you would like. Any Questions about copyright information? This is a must read ! Do you have a letter or e-mail that you have received that sounds too good to be true. Then it probably is. Something like: you have won a large sum of money, or maybe someone wants to pay you or give you money. DO NOT GIVE OUT YOUR PERSONAL AND BANK INFORMATION ! DO NOT SEND ANY MONEY ! There are a lot of Scam's, Fraud's, and Rip-off's out there on the internet as well as the regular mail. Due to the amount of this stuff going on I felt it necessary to start posting all the ones I get. From Lotteries to Work at home. I will add more as I get the time. It has my fireworks video taken with my new HP Photosmart M22 Digital Camera on June 24th 2006 at our church in Birdsboro, PA. U.S.A. at their strawberry festival fireworks display. Also fireworks photo's that were taken with my Nokia 3200 Digital Camera Phone, and my Bell+Howell credit card size Digital Camera on July 3rd 2004 at the Pottstown, PA. U.S.A. 4th of July fireworks display on page 1 throught 4. More fireworks photo's that were taken with my Bell+Howell credit card size Digital Camera on July 4rd 2005 at the Pottstown, PA. U.S.A. 4th of July fireworks display on pages 5 and 6. More fireworks photo's that were taken with my new HP Photosmart M22 Digital Camera on June 24th 2006 at our church in Birdsboro, PA. U.S.A. at their strawberry festival fireworks display on page 7. More fireworks photo's that were taken with my new Vivitar ViviCam 5386 Digital Camera on June 22th, 2007 at our church in Birdsboro, PA. U.S.A. at their strawberry festival fireworks display on page 8. My Dragon Web Ring's Entrance Chamber. My Poetry Web Ring's Entrance Chamber. My poems about Dragons "DragonMay's Poems", and my story chambers "DragonMay's Stories". My love poems "Moments In Time", and "Poems About Love". Also check out my poem chambers "The Lighter Side", and "The Darker Side". Slot Machine, Simon Says, Battle Ship, Connect Four, Tetra Blox, and More. My Dragon Links Chamber where you will find links to some other Dragon related sites. My Non-Dragon Links Chamber where you will find links for Poetry Sites, A few misc. sites, Links for sites with things for your web site, Links to Web Comic sites, Link to Children safety sites, Links to Sites on how to protect your self from fraud and scams, Links to United State Government Sites, Links to different internet search engines, Links to site with maps, and Links to weather sites. 10 (Ten) Double Dragon Avatar and 1 (one) Triple Dragon Avatar on another page. 46 (Forty Six) Dragon Tour Vehicle's spread out over 3 (Three) pages. where you can sit and listen to music (or not) while chatting with friends. This is My Fun Room's Chamber. There are 6 (Six) different color rooms here. They are all one solid color with nothing else on them. There are also solid color Avatars that you can save/download to use in the rooms. (If you already have them that is fine too.) You can go into the rooms with your normal Avatars if you want, It's up to you. But it's harder to be found if your Avatar is the same color as the room. If you have gestures for your chat program you can attack each other using them, if you can find each other. Play hide and seek, or make up your own games. Just Have Fun. along with different things that happen to me or that I do. I find from time to time on the web and I find amusing. Other than that theres no telling what I may include in them. If you would like to link to my site I have some Banners and Buttons you can use. Please do not link the Banner or Button to the ones on my server. Save the Banner or Button and upload it onto your site. I will be changing the name on them from time to time. If you know someone who may enjoy DragonMay's Lair or find something useful here, don't be afraid to send this page to them. If you enjoyed DragonMay's Lair or found something useful here, don't be afraid to sign my guest book and let me know. Here is a script that will make the entrance to my lair your browsers start up page. If you have any questions or comments about anything you found in my lair, don't be afraid to send me an e-mail and let me know. I am always looking for new ideas and improvement for my lair. The Music is set to loop. You may turn it on and off with the controls just below. Works best if you use RealOne Player as your default Midi Internet player. Get RealOne Player by clicking here. If your browser doesn't support the EMBED tag, you can still listen to the music on this page by clicking here.